North Western Railway Recruitment 2018: For filling up NWR 24 Technical Supervisor Posts official notification has been published as North Western Railway Recruitment 2018-19 on its official website. Interested candidates can apply for current Railway vacancies through offline mode now. Those, who meet the eligibility norms needed for North Western Railway Recruitment as mentioned in the Notification No. 01/2018 (NWR/Construction), can apply for the suitable post via offline process only. The last date to submit application for North Western Railway openings in prescribed format is 26-09-2018. Direct Link to Download Application for Technical Supervisor Posts: Available Here!!! Applicants will be selected for North Western Railway Technical Supervisor vacancies through screening. Candidates can enroll themselves for selection process by visiting the direct link provided here for ease and comfort of candidates. Candidates can easily enroll themselves for North Western Railway Recruitment 2018-19 by filling up their offline application form with the help of instructions provided below on this page, which is well tailored by the team of www.privatejobshub.in. Applicants must have acquired bachelor’s degree or diploma in relevant fields or trade as per the requirement of the post they have to apply for then only they will be considered eligible for North Western Railway posts. Candidates will be selected on the basis of their qualifications as mentioned by them in their application form and will be finally selected as per the weightage of qualifications decided by the North Western Railway and after qualifying Professional Personality Test. Fee is to be submitted by the candidates through demand draft only which should be drawn in favour of “FA&CAO/C/NWR” payable at Jaipur. The very first step for the aspirants is to visit North Western Railway official website that is www.nwr.indianrailways.gov.in or the direct link provided below to download North Western Railway application form. Through home page move the cursor towards “News & Recruitment” section and tap on “Recruitment” link from the drop down list appeared which will navigate you to another page. Search the suitable link for “Engagement of Technical Supervisors” and hit the same through which detailed advertisement regarding Technical Supervisor Posts will appear on the screen. Read all the instructions mentioned in the notification and if you satisfy entire eligibility criteria the download the same notification. Fill the details required in the application form correctly and send it to the postal address mentioned below. We hope the above gathered information is enough for the candidates willing to apply for North Western Railway Recruitment 2018-19. For more important information and latest updates visit it’s Official Website on regular basis. North Western Railway Recruitment: To appoint eligible aspirants for Sports Quota posts, North Western Railway Recruitment is issued. 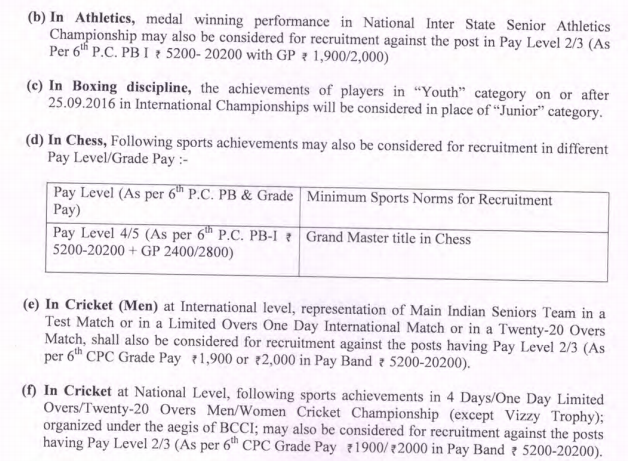 There are 21 job openings of Sports Quota in organization. You may apply for NWR Vacancy after checking all details. Closing date for submission of application form for North Western Railway Recruitment 2018-19 is 20-08-2018. After closing date, no form will be accepted. Read all instructions carefully prior applying. Hiring panel of organization will conduct Sports Trials, Interview and assessment of sports achievement to shortlisted contenders for NWR Sports Quota Jobs. You may present well in all sessions to get appointed for NWR Jobs. To know about number of vacancies & pay scale for NWR Recruitment, go through table provided below. Obtained minimum 3rd position by representing theCountry in the World Cup( 1 unior/Senior) WorldChampionships (Junior/Senior)/ Asian Games(Senior)/Commonwealth Games(Senior), exceptGold Medal in Asian Games. Represented a State or equivalent unit and obtained at least 3rd Position in Senior/Youth/Junior National Championships. Degree or its equivalent from a recognized university. Pass in 1st year of B. Sc (Physics) or, a pass in 10+2stage in Higher Secondary in Science (Math or Physics)for the post of Electrical Signal Maintainer-II in S&T Dept. 12th (+2 stage) or its equivalent examination from recognised Board/University. Matriculation or its equivalent from a recognised Board and having ITI certificate may also apply to be posted as Tech-III. Age of applicant applying for North Western Railway Sports Quota Recruitment should be minimum 18 years while maximum age is 25 years as on 01 Jan 2019. Those who belong to reserved category will get relaxation in age as per norms of government. Applicants applying for NWR Sports Quota Vacancy are required to pay application fee as listed here. Pay your fees through DD/IPO should be drawn in favour of "North Western Railway Sports Association" payable at Jaipur/G.P.O. Jaipur. Contenders will be shortlisted for NWR Recruitment on the basis of Sports Trials, Interview and assessment of sports achievement & educational qualification etc. Shortlisted eligible aspirants will be invited for Trial of sports performance. It is organized to assess sports performance of applicants. After trial, only fit contenders will be invited for Interview & assessment of sports achievement & educational qualification etc. session. Here is applying process for North Western Railway Vacancies. Move under right side under ‘Latest News & Events’ section. From various links, press on ‘hit here to view the Notification & Application Form of Sports Quota Recruitment (Notification No. 01/2018(NWR/Sports/Open Advt.) 20-07-2018) for the Year 2018-19 (English)’ link. Go through all details as listed in North Western Railway Notification 2018. At next step, you may download North Western Railway Online Application Form 2018. Fill asked details in North Western Railway Application Form as need arise. Attach required documents along with form. You may forward your form at address placed below. In this way, you may apply for North Western Railway Recruitment. Go through its Official Link for more details about North Western Railway Recruitment 2018-19. Stay tuned with us for knowing more updates concerning latest jobs & others.